This article about Michigan driver’s license restoration will be a return to the more detailed examination of a single aspect of the license appeal process that is typical of most articles on this blog. The last stage in the driver’s license restoration process is the appeal hearing. In my practice, making sure my client is thoroughly prepared for it is beyond “important,” it is absolutely critical. In all my years as a driver’s license appeal lawyer, I have NEVER gone into a hearing without having carefully “prepped” my client for every single question that will be asked, and every last thing that is likely to take place. In the last couple of weeks before writing this article, my schedule of hearings has exploded due to the recent Christmas and New Year’s holiday. Whereas I normally have about 2 or 3 hearings every week, the last few have deposited about 4 or 5 on my calendar. I really notice this because of the time in invest in each my pre-hearing “preps.” Normally, I call each client the evening before his or her hearing, long after the close of the business day. “Preps” can last anywhere from about 40 minutes to a bit more than an hour, depending on the facts of the client’s case and the number of questions or concerns he or she may have. All of my driver’s license restoration appeal hearings are scheduled at the Michigan Secretary of State Driver Assessment and Appeal Division (DAAD) office in Livonia. Beyond being the default hearing location for cases in the Metro-Detroit area, it would hardly make sense for me to scurry between the other hearing offices in Lansing and Grand Rapids. In other articles, I have made clear that I do not believe in video hearings, even though I could easily do them. In fact, the nearest video location is about 3 to 4 minutes from my office, while the actual hearing location requires nearly an hour’s drive. I would never sacrifice a live hearing because I think it’s essential that the hearing officer deciding the case can get a close up view of my client’s body language and demeanor. This is particularly true for me, because I only accept cases for people who have truly quit drinking and are genuinely sober. I don’t want any of the subtleties that mark the profound transformation from drinker to non-drinker to get lost in a boomy, choppy, webcam-type video feed. Because of my extensive hearing experience, I know the very different personalities of each of the 5 Livonia hearing officers. Recently, one of the hearing officers announced a preference to have the lawyers do virtually all of the questioning. This stands in stark contrast to how things are done by the other 4 hearing officers there. Regardless of the assigned hearing officer, every one of my clients will walk into the hearing knowing exactly what questions either the hearing officer or I will be asking. While that sounds good, merely knowing what questions will be asked hardly amounts to being “prepared.” Instead, being “prepared” means understanding the bigger picture of what issues are up for decision in a license appeal, and very specifically how the facts of your case fit into them. I know that enough other lawyers read this blog, so I’m not about to roll out, step-by-step, how I prep my clients for a hearing (sorry, guys), but I will point out a common thing I see, and which makes me cringe every time I see it. Obviously, when you do as many license appeals as I do, you not only spend a lot of time in hearing rooms, you spend a fair amount of time in the waiting room, as well. I’ve always considered myself a student of human behavior, and I’m not ashamed to admit to people watching. Very often, I’ll see a lawyer stroll into the DAAD hearing office, shake hands with his or her client, and then lean in close and confer to do some last minute preparation. In fact, two days before this article was written, I saw a lawyer walk in and start reviewing the paperwork in his file with his client to double-check dates and such. Sometimes, I will see a client hand the lawyer a document, like a letter of support, and the lawyer will read it for what is obviously to be the first time. That stuff never happens with me. In the first place, I highly doubt anyone I’m describing provides his or her legal services with a guarantee, like I do. When I greet my client in the hearing office waiting room, we are so beyond prepared that we’ll relax a bit and talk about the weather, or the drive in, or whatever. If there is anything whatsoever to go over in the minutes before a hearing, it would seem to me that a catastrophe is about to take place. Moreover, while it can happen that once in a while a client will provide an original, notarized letter for last minute submission at the hearing, I will certainly have edited and reviewed that letter in the first place, and will already be familiar with its contents. Another essential and initial part of the preparation is for me to re-familiarize myself with the file. I suppose that because license appeals are the bread and butter of what I do, I have developed the ability to recall each client’s case almost photographically. In other words, I don’t just read over the file; before I call my client to do a prep, I spend enough time to memorize the file. When I talk with my client, I know which of the letter writers said what, and I know his or her sobriety date, and other essential information on the substance abuse evaluation. I know what the evaluator has said, and why she (or, in some cases, he) has said it. It seems basic and fundamental to me that when we are sitting in front of the hearing officer, I know every bit of information in my client’s case file. That won’t happen by reviewing it in the waiting room. There is an old maxim for experienced trial lawyers that applies to license appeal hearings every bit as much as it does to murder trials and multi-million dollar civil cases: Never ask a question to which you don’t already know the answer. To do that in a license appeal, you have to know the client’s case. This is another place where that the 3 hours we spend at our first meeting shows up to pay dividends. To know the case, you have to know the client, as well. All of this, from that first meeting to the time spent reading and then editing the letters comes full circle as we settle in to do the prep the night before the hearing. I generally prefer to make my prep calls in the evening. Given that I tend to work late, many of my calls are made after 8 pm, and I have even been known to call after 10 (usually, that’s because I have several preps to complete). Whatever else, I cannot stand being interrupted for any reason when I am in the “zone” doing a hearing prep. This is why preps are done after hours, when my office has closed for the day. When I get on the phone with my client, he/she and I are the only 2 people in the world. I don’t have to worry about call waiting or some other interruption breaking my concentration. I take this very seriously. My guarantee to win every case I take is great for the client, and protects him or her from any risk associated with losing the appeal, but beneath that lies the inescapable reality that I make my money winning these cases the first time, not having to come back later to do “warranty work.” I want to win the first time every bit as much as my client does; I am, in every sense, invested in doing just that. As a result, , I live by the mantra that there are no shortcuts to winning a license appeal. This is why I have never done a hearing without having first prepped my client. I cannot even imagine walking into the waiting room of the DAAD hearing office and having any unfinished business, or having a client waiting for me with any unanswered questions, or outstanding concerns. For all the work that goes into assembling a winning license appeal, the core reality is that none of it would matter if we weren’t preparing to go in and tell the truth. This, to me, is another key part of the prep. I NEVER have to worry about details, or making sure that there is consistency, or that BS stories line up; my clients are people who really have embraced sobriety, and a sober lifestyle, so as a result, all we have to do is work on making sure that comes out. We simply have to tell the truth. When you think about it, this should help relieve a lot of nervousness. Since the meat and potatoes of a license appeal is proving, by what the DAAD rules require as “clear and convincing evidence,” that your alcohol problem is “under control,” and, more important, that it “is likely to remain under control,” a person who really has stopped drinking and who has both the commitment and the tools to remain alcohol free should welcome the opportunity to talk about that. There is no BS involved here, at least not the cases I take, and that, to me, makes all the difference in the world. 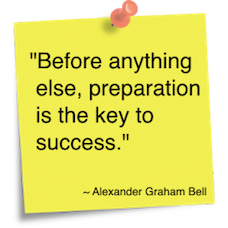 People who know success know that it is almost always the result of good work and thorough preparation. World-class musicians and athletes are “world class” because they practice and prepare. I’ll be the very first to agree that license appeals are generally won or lost in the preparation, and I’ll be the very last person to go in less than completely prepared. As a result, I make sure my clients are as prepared as they can be. Good work is the key to good fortune; the payoff for all that work is the valid license each of my client’s slips back into his or her wallet.